— The self-proclaimed fanservice episode turned out to be thoughtful and sweet, which encapsulates this show’s weird appeal. 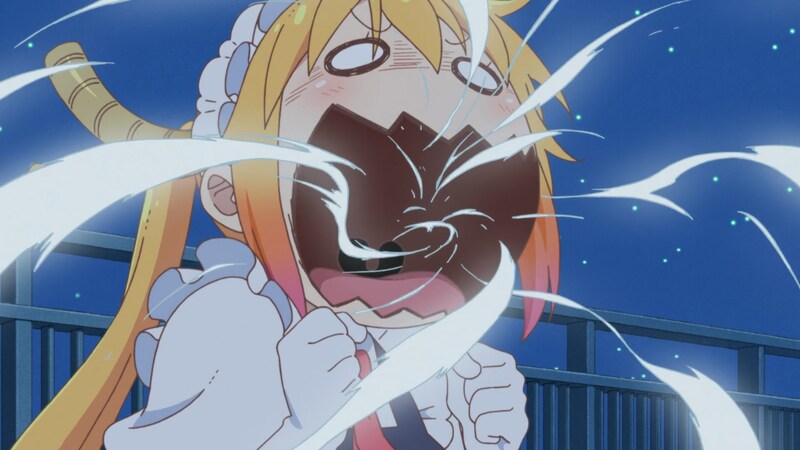 Tohru’s feelings of inadequacy aren’t new, nor is the struggle to fit in a foreign world. 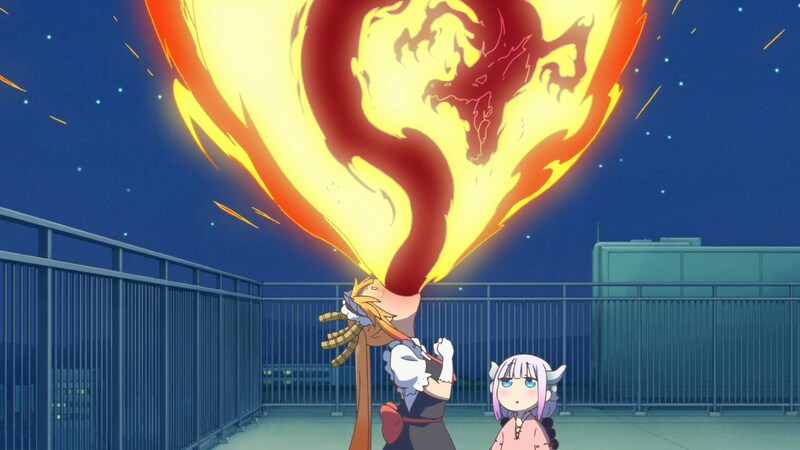 The couple’s sense of normality is very different, and mentions of family make the dragon girl uneasy that perhaps they’re just too incompatible. 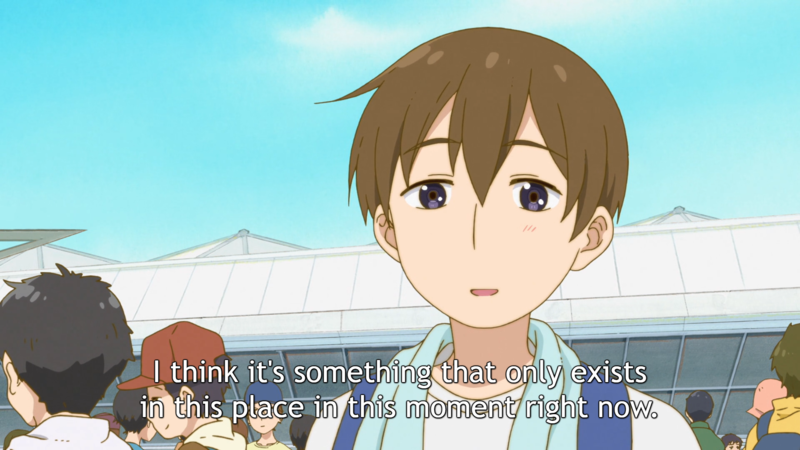 I absolutely adored how they tied all threads at the end with Tohru finding an answer as to why do thousands upon thousands of passionate fans subject themselves to something as exhausting and nonsensical as Comiket. It’s as straightforward as the thing they like only existing there at the moment. 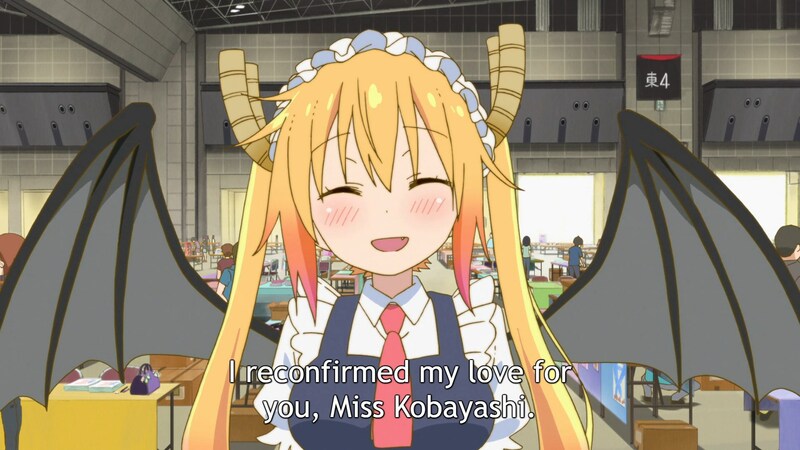 Similarly, she’ll stay in the human world against dragon logic and despite the pain that will induce because Kobayashi is there right now. 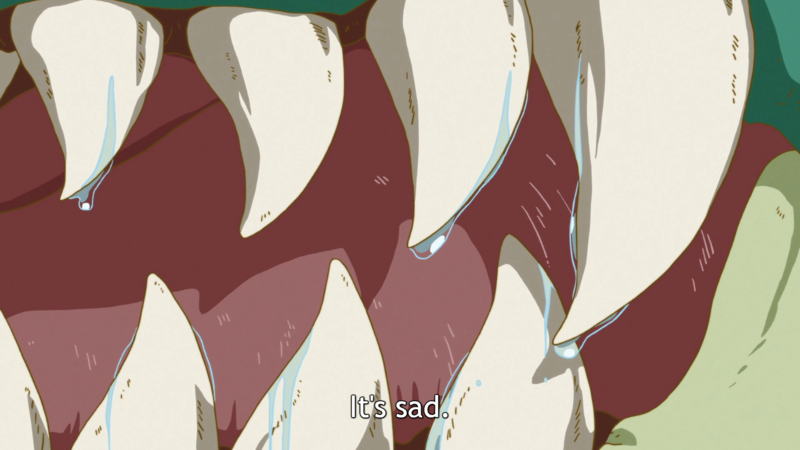 — I’m briefly interrupting this relatively serious commentary to say c’mon you can’t make me sad with salivating dragon fangs representing tears. Well, you can, but that’s the problem. Screw you show. — Fun animation galore. 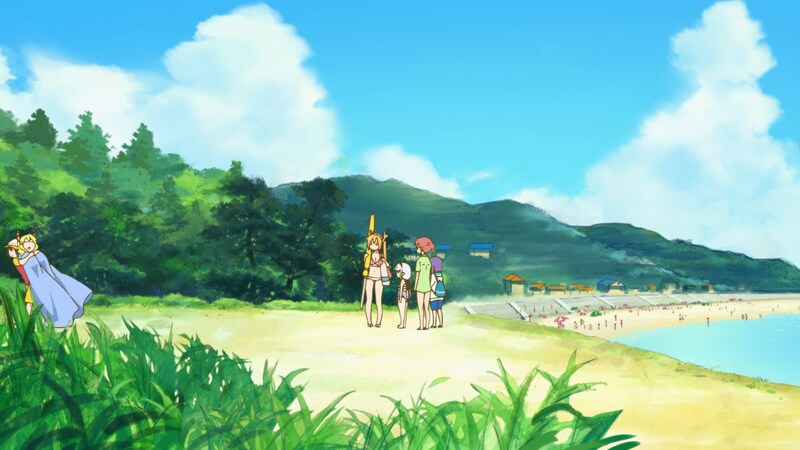 The 2D effects were once again a highlight, both their detailed beauty and the fluidity, plus Noriyuki Kitanohara used his animator brain to come up with some spectacular sequences. But it was actually the cartoony moments that left the biggest impression on me through outstanding scenes and amusing character art; besides the usual polish there’s many fun usages of smears and multiples, elasticity to make all cuts more lively and tons of variety when it comes to the art. Excellent job by Yuko Myouken as supervisor, it’s a joyful episode all the way through. Kadowaki and Maruko acted as assistants, though they were wrongly credited as regular animation directors – anime credits being off is fairly common, and it’s not the first minor mistake on this series. Not that it makes much of a difference, but it stands out since Maruko clearly didn’t supervise two consecutive episodes. — A new youngster has been promoted to key animation at KyoAni, something that hadn’t happened in over a year and thus worth highlighting. Tomomi Sato graduated from Tokyo Zokei University in 2014 and joined the studio in 2015, blazing through training and getting credited for in-betweens for the first time in High Speed!. Her graduation project/indie short-film LADY RAND LAND is well worth watching whether you’re interested in studio minutia or not, it’s very creative and plain fun. Back in 2014 the industry legend Shinsaku Kozuma commented on it by saying it was hard to believe that was amateur animation and that perhaps we’d be seeing those names pop up in anime…which is exactly what happened. 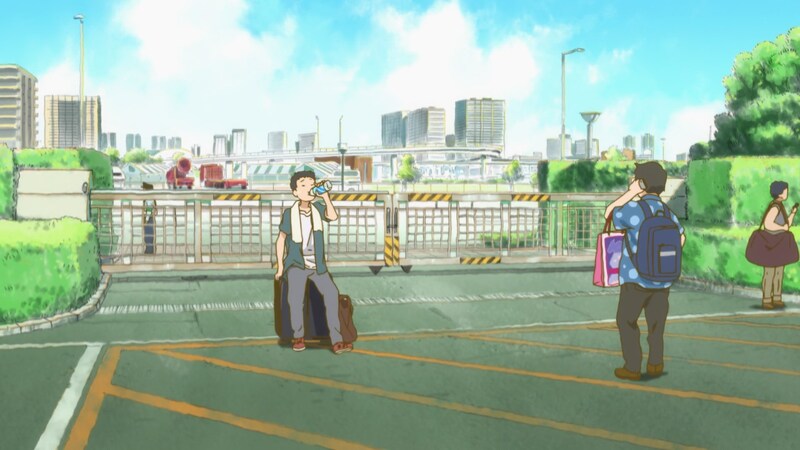 Its director and co-animator Haruka Otsuzumi has also joined the industry as a freelance animator – you can find her this season on shows like Akiba’s Trip, mostly doing clean-up work still. Either way, Tomomi Sato’s art always stood out in its eye-catching simplicity when looking at the staff books, so this promotion is no surprise. Might be a name to keep track of! 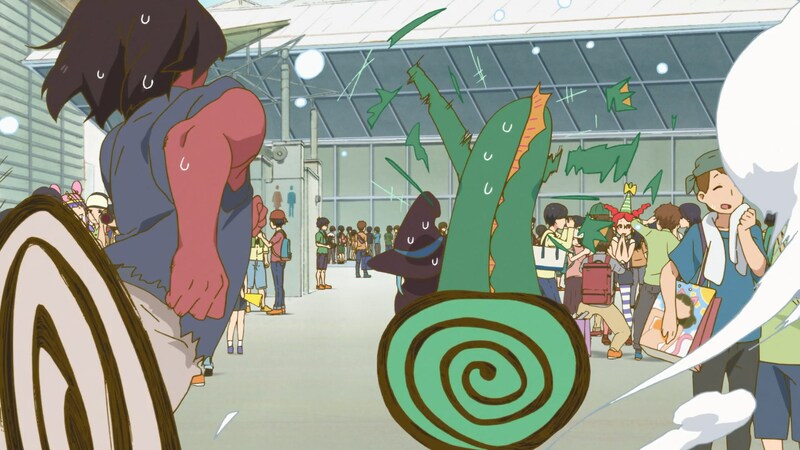 — And since I’m already peeking behind the scenes, I’d like to mention that Yasuhiro Takemoto (who wrote the script again) attended Comiket for the first time last summer, clearly as location hunting for this episode. 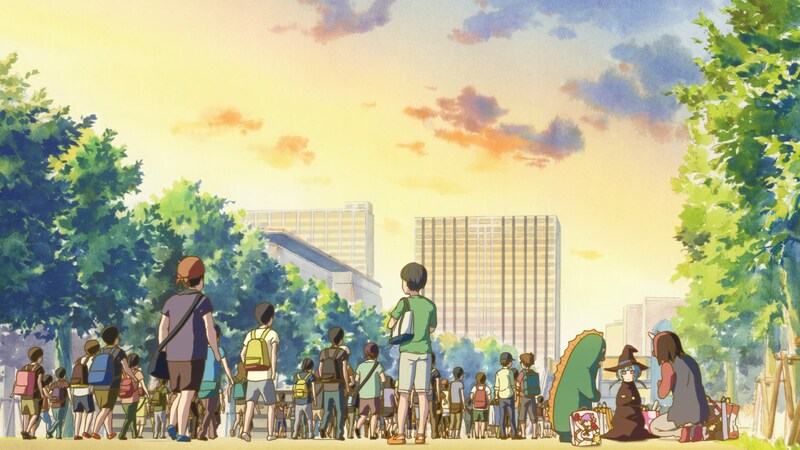 There was honestly no need to do it since it’s a perfectly well-documented setting, but Takemoto walked off with a grasp of its bothersome yet intensely passionate festival-like atmosphere which is exactly what he wanted to depict. The actual organization helped the team out and that’s why they didn’t even have to come up with a crappy parody name, which is a nice change of pace. He had fun despite the queueing hell too, so I’d say the thoroughness really paid off here. 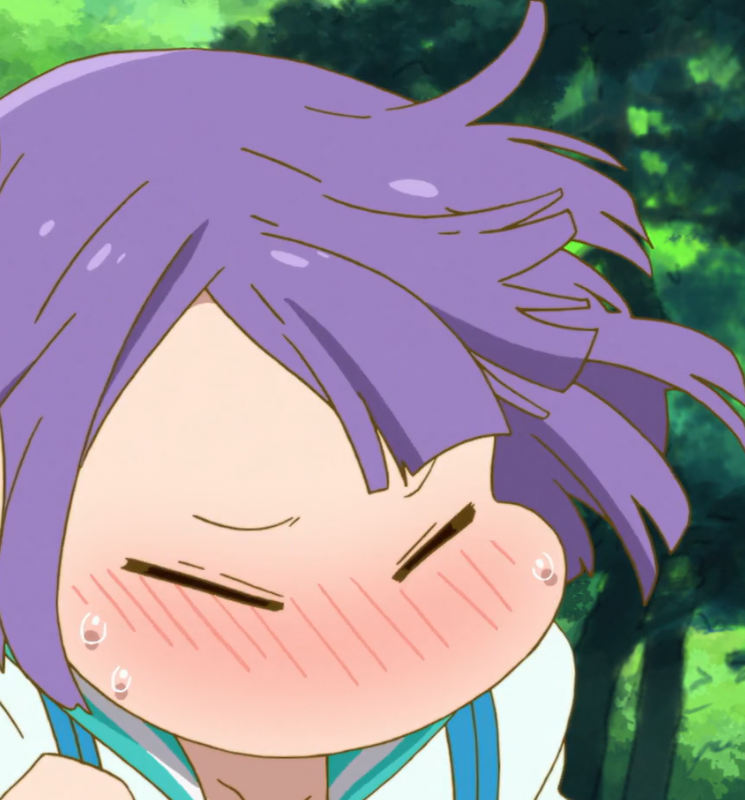 — This episode was actually animated in Osaka, by the Animation Do branch of the studio. So far #4 was the only episode they’d produced for the series, and the next one won’t happen until some unconfirmed point around #10~12. It makes sense for them to be tasked with this episode then, even though it was storyboarded and supervised by people at the main Kyoto studio. Ultimately it makes no difference for them nor the viewers, it’s simply a way to optimize assets rather than force animators to sit around for a whole month after they’ve finished their job. — Backgrounds corner! 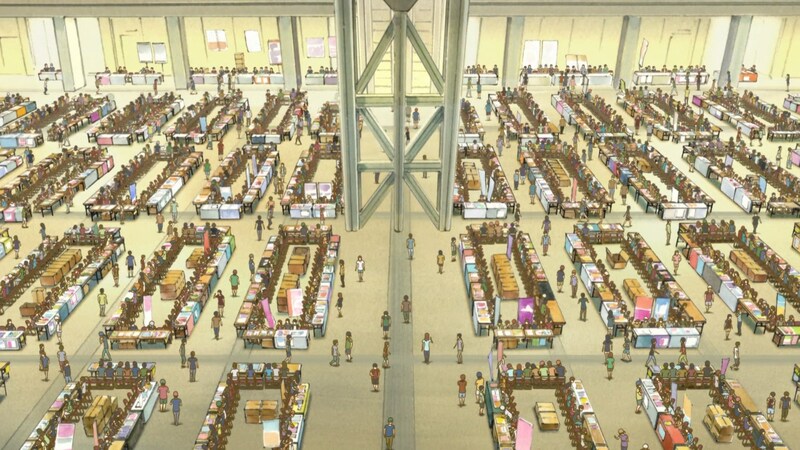 Business as ever when it comes to the beautiful sceneries, plus some extra effort put into making their Comiket experience feel vast and way too hot. This is Takemoto’s second of at least three scripts.